Real Photo Postcard of Edgar Darling in what appears to be a World War I era uniform. Unfortunately, there is no further information regarding this particular Edgar Darling's identity; it was, no doubt, a common name. 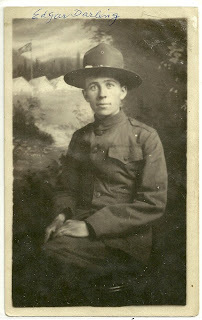 There were several Edgar Darlings who filled out WWI draft registration cards, and over 1500 more with Edgar Darling as only part of their name. If you recognize Edgar from family photos, please get in touch with me. Thanks.